The state government has ordered universities across Maharashtra to immediately stay the admission process to degree colleges as it is planning to move the Supreme Court challenging the Bombay high court’s 2017 decision quashing reservation for backward category students in minority institutes. The decision could derail the academic calendar and affect thousands of students. While the Bombay high court order came in November 2017, TOI reported about the change in the admission process on Tuesday and how the merit lists of colleges would have no quota for backward castes. On Wednesday, several student organisations protested against this decision and forced the government to move the SC. In 2005, the then Congress government had amended the Constitution, stating that since reservation in minority educational institutions was 50%, there was no question of further social reservations. However, a circular issued 16 years ago by the Mumbai University had stated that minority colleges need to set aside seats for backward category candidates. 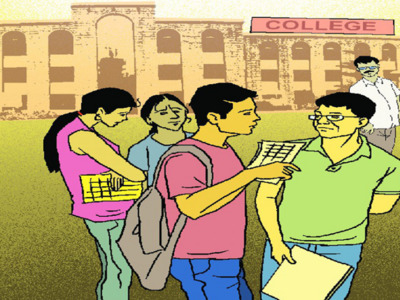 “In 2005 it was made clear that there will be no reservation for SC\STs in minority colleges. In November 2017, the Bombay high court scrapped a circular issued by the Mumbai University in this connection. The move to approach the SC is against this HC order,” added Tawde. The first list of degree colleges on Tuesday contained no quota for backward category candidates in minority institutes, both religious and linguistic. At the same time, seats for open or general category students almost doubled in count. Some of the most prominent colleges in the city are minority institutes, like St Xavier’s, HR, Mithibai, Jai Hind, KC and Narsee Monjee. A recent directive from the Mumbai University stated colleges must conduct admission in line with the Bombay HC ruling of November 2017. The court set aside as unconstitutional the circular issued 16 years ago by Mumbai University. Rajkumar Badole, minister for social justice department told TOI the minority department will file an SLP on Friday in SC. “We are concerned about reservation for OBCs and SC/STs, which is 25%. It should be intact in minority status institutions and 50% seats should be for the minority community,” said Badole. Removing reservations is unconstitutional, he added. There are 2,800-plus education institutions across the state which hold the minority tag; of these, about 300 are in Mumbai. Meanwhile, an official said the department has issued instructions to all minority status institutions about compiling data of the last three years on admitted students and whether they had filled the 50% quota from the minority community. College principals are shocked by the state’s decision. “We are not aware of it,” said Sunil Mantri, secretary of the Minority Colleges Association. “The HC decision came in November last year. Why wake up now? This will derail the entire academic calendar which is already running late because of the on-screen assessment. Worse, despite us being interested parties, we were not even invited for the meeting on Thursday,” said another principal.